A half-century ago last week, a BMW 1600-2 rolled off a Munich assembly line, freshly bathed in an off-white paint color called Chamonix and assembled by what I can only assume were meticulously trained German craftsmen, peering down their noses through reading glasses as they expertly cinched down every nut, bolt, and screw on the car. Fifteen days later, it rolled off the boat in New York City under the brief stewardship of Hoffman Motor Car Company before being shipped off to its first owner under the Californian sun. Over the next 43 years, the car served under a slew of owners, suffered at least one collision, apparently sheltered a family of rodents, and somehow retained its original 1.6-liter engine. Over the last seven years, the car has had three engine swaps, a full suspension rehabilitation and update, bigger, more capable brakes installed at all for corners, a rewiring from headlight to taillight, two headliners, a new(-ish) interior, two sets of wheels and three sets of tires. I’ve cobbled together a keyless entry system, and it even has an acceptable stereo. I never did get to painting it, though. And now, she’s 50. She’s become a Molly Shannon punchline. My formative automotive years spanned the mid-1990s. 1960s and ‘70s American muscle car owners were my early envy. Japanese sports cars were really hitting their stride, and I distinctly remember seeing E30 M3s in parking lots in their pre-legendary years. My high school parking lot was mostly populated by late-1980s pickups and American sedans less than 15 years old. Keeping the simple engines running was possible, but you had to source wearable mechanical parts from evaporating supplies. Manic drum brakes made for white-knuckled stops. If gas wasn’t so cheap in the ‘90s, then driving a fuel-guzzling sled would have also been a challenge. There was a time when labor was cheap and automotive technology was simple enough that you could keep modifying an older car. By the ‘90s, though, labor had already began to be more expensive and technology wasn’t cheap or advanced enough yet. No one was swapping malaise-era drivetrains into ‘46 Fords; it just didn’t make sense. While parts were still being made for 20-30 year old cars, finding a fender for a 1947 Studebaker Champion Deluxe usually meant a hopeful drive to an annual swap meet. Fast forward to last week. 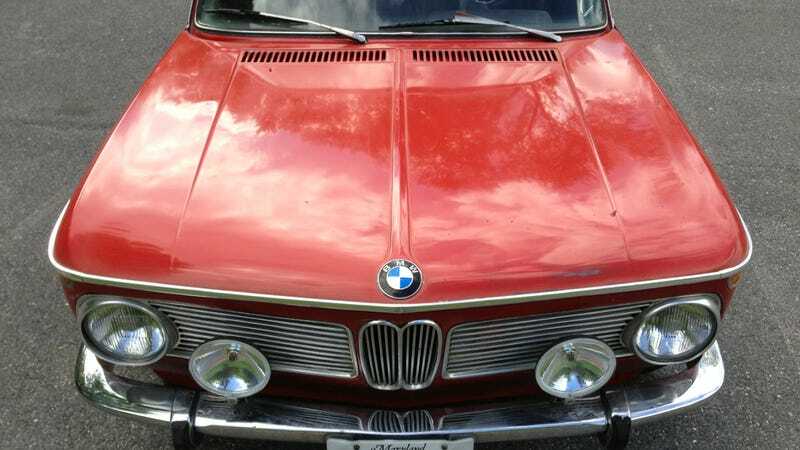 My 50-year-old BMW has no problem keeping up with traffic or braking and turning to avoid it. This is made possible by two important concepts: the passage of time and the internet. To begin with, the Bavarians designed a really capable suspension system from the start. MacPherson struts and disc brakes up front paired well with the independent rear suspension. The factory four-cylinder happily made use of its overhead cam and effortlessly sang a 4100 RPM note at 70 mph. In short, technology has come a long way in 20 years. Then, the internet showed up. Suddenly, vintage car owners were connected with each other. Massive trading networks of parts and knowledge opened up as modern technology gave birth to the source of almost all knowledge, hatred, and wastes of work hours: the message board. Additionally, other technologies began to contribute. Laser scanning, 3D printing, virtual physical testing, and computer-driven milling machines began to produce better solutions for maintenance and upgrade. Crowd-funded projects helped push area-specific technologies, leveraging thousands of hours of engineering time, all to make keeping your car on the road, because other people share your passion. If you get stuck, just upload a YouTube video and someone will home in with the solution. Now, we have resources. Parts are more and more available. For some models, you can even buy an entirely new body. For others, you can bolt on or modify other, more common parts to fit your car, thanks to experimentation by other enthusiasts. Recently, I counted parts from as many as 10 different models of cars currently installed and working together in my 1600. I’ve got an engine and transmission from an early ‘90s E30, brakes from BMW, Volvo, and Volkswagen models, and random, custom-made pieces to make it all work. At one point, I even had Ford ignition parts under the hood. Sure, there are challenges. Some parts just aren’t available and may never be. Others are getting rare enough to skyrocket in price. I’m fairly certain that I’ll never find the super-rare correct nose trim that is specific to my car, but then again, someone might figure out a way to fabricate it before long. So now, my half-century-old 1600 doesn’t seem so old. There may be a day where it becomes unsustainable to keep my car on the road, but for now, that day is far beyond the horizon. I guess I’ll keep driving it.